Published October 26, 2010 By Anna T. This post may contain affiliate links. Regardless, I only recommend sites I've researched and/or used and trust. Becoming a Thirty One Gifts consultant means signing up to start your own business from home, selling attractive bags and organizational items. Some other things you may sell include wallets, key chains, stationary, storage/organizational items, and they even have a line of items for kids. You can additionally get the items you buy personalized with embroidery, which is very nice. That said — even though they've branched out into other products — the primary focus of this company is and always has been on bags and accessories. You can become a consultant for their company and sell the above items either directly, through parties, social media, or with your own personalized website they set up for you. But, is it worth it? 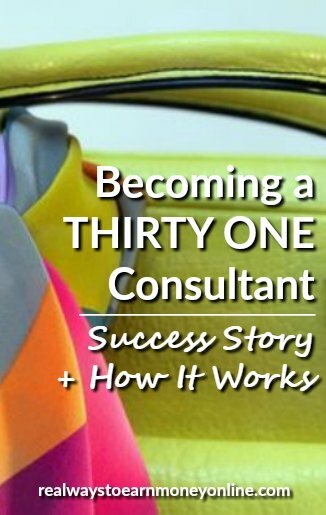 Below, we'll talk about the ins and outs of becoming a Thirty One consultant so you can decide for yourself if this is something you should jump into or not. After becoming a Thirty One consultant, you can get 25 percent commission on all your sales. You also earn a percentage of the sales from other people you recruit to become Thirty-One consultants. The company will need you to sell at least $200 in product every three months to remain active. They also offer all kinds of bonuses and other incentives. Plus, Thirty One consultants get a discount on products — 25 percent! When Do Thirty One Consultants Get Paid? Many people are curious about how the Thirty One commission payout schedule works. You submit all the money from your sales to the company, and they will send you a commission via direct deposit to your bank twice each month. The Thirty-One consultant website provides information to help you start. Additionally, the person you signed up under should provide you with support and aid you in launching your business. Just as it is with any home business, making money often means spending money. To start, you'll have to pay $99 for your consultant kit. This kit includes $300 worth of items made up of new products plus some business supplies. They have another kit that is higher-priced ($179), but it comes with more items to start you off. If you are making sales, you should be able to earn this investment back. And another thing to think about is that, even if you decide becoming a Thirty One consultant is not for you, you can still keep the items from the kit for your own personal use. I know someone personally who sells Thirty-One and is very happy with it. The company literally changed her life and made it so she could quit her full-time teaching job to stay at home with her own children. She's also genuinely a huge fan of their products. Is this how it goes for everyone? Of course not. She had to work really hard and put her heart into making it work. Not everyone is going to be that motivated. But even if you're not super-motivated, be mindful that many people still earn a nice side income by doing this part-time. Overall, this is not a bad direct sales company compared to some others. The start-up cost is reasonable and you get lots of stuff for it, plus the products are really nice and I can see how they would easily sell themselves. I personally own a few Thirty One bags and can speak for their quality and design. The 25 percent commission rate is fair as well, although it's not quite as high as you may get from other companies. But, as is the case with most direct sales companies, there are always opportunities for bonuses, incentives, etc. Our Thirty-One Gifts consultant is Kristen Burnett. You can go here to join Kristen's team. I am in a sales position part-time as it is, and one of my friends from high school has recently tried to get me to sell Thirty-One because I love the product anyway and I am a good salesperson. Would you still recommend someone selling Thirty-One as a consultant on the side, in addition to being a full-time college student and having a part-time sales job that only offers about 10 hours per week? Hi – All the info you need should be on this page – https://www.mythirtyone.com/the31chix/?verify=true The name of the Thirty One sponsor for this blog is at the top right, Kristen Burnett. You can click the contact button below her picture to send her an email about joining. Good luck! This is the most informative review I have seen. I have thought about doing it but was wondering how you actually get paid. This has made my mind up and I am going for it! My Thirty One check for this 2 week period is only going to be $300 less than my teaching paychecks were. Amazing…. My wife sells thirty one and has done great. I am really impressed with the products as well as my wife's excitement with her new found "Job". This month she has sold almost $3000 dollars worth. That $750 commission check will be in the bank next month and we will be going on a vacation a couple weeks later. To anyone thinking of getting into thirty one, do it. You do have to put forth the effort to learn the product and make some sales. But its well worth it! Thank you for your helpful comment, Jay! $3000 worth of products in one month is incredible. I hope you enjoy your vacation!